This simple to use device will tell you how much electricity you are using for the plugged in load. It will work up to 15 amps according to the label on the rear of the device. It has 5 buttons on the front that display the voltage, amperage, wattage, hertz (60 in the US) and a projected kilowatt hour estimate. 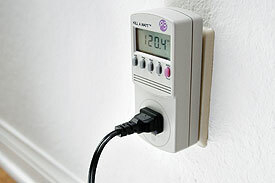 You could plug your TV or coffee pot into it and get an idea of the cost of operation by multiplying your kilowatt per hour rate from your electric utility by the "KWH' reading on the display and again by the number of hours per day, week or month etc. I have had one for about a year and have found it to be handy to have. 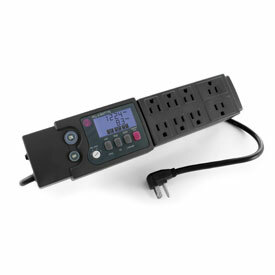 I don't have one of these, but it displays everything the unit above does plus has built in surge protection. It mentions over current and over voltage protection in their advertisement too. "No one person or group can insure our environments future. We all must take an active part. Knowing what can be done, and doing your part, is as important as taking your next breath."